As we discussed in a previous post, email marketing not only allows you to bring in new leads but also helps renew existing customer relationships. We’ve already covered how to capture your audience, get people subscribed to your list(s), optimize your subject lines, and connect to your readers. 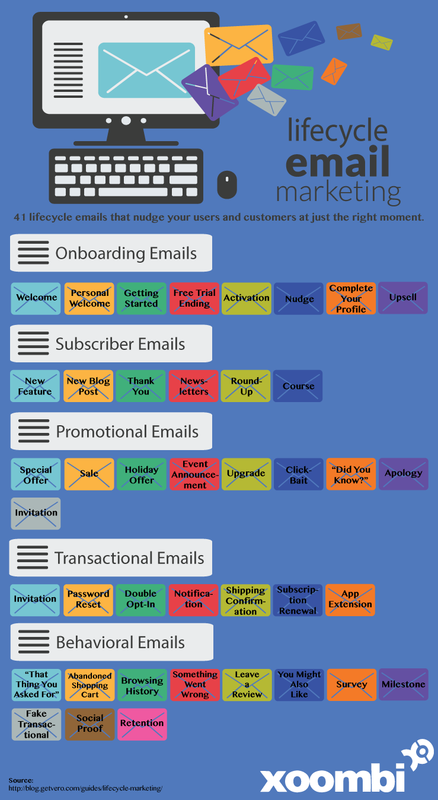 Now it’s time to focus on what types of lifecycle emails you should be sending. Thanks to our friends over at Vero, we’re able to provide you with a comprehensive list of different lifecycle emails you should be sending throughout the buyer’s journey. Whether you’re reaching out to a brand new prospect or a repeat customer, here are 41 types of lifecycle emails that can help boost your email marketing campaigns. This is the most important email in your onboarding process. Be welcoming while also making your call to action clear and actionable. This email is to help people progress to the next stage in the buying funnel. Start a conversation with new users, subscribers, and customers. Ask your readers questions about what they expect from you and/or how they found you. Make sure these are sent out during business hours. This can either be sent instead of or in addition to the welcome or personal welcome email. Use this email to get readers to take a single, focused action. Shape the content of your email to provide readers good reasons to convert and start using your product or service today. You need user information in order to tailor your marketing efforts around your lead and customer data. Encourage users or subscribers to complete their user profiles. The upsell email will offer something valuable to your readers without annoying them. Include similar products to confirmation emails of what’s about to be shipped or inform them of an ongoing deal on your site. This email is your last chance to convert a lead into a paying customer. Re-engage users one last time with direct language. Subscriber emails help you maintain active relationships with leads and customers. Here are six emails to help keep readers engaged. This is probably one of the most common types of emails sent. Get traction on a new post by promoting it to your current subscribers as well as via other channels. Another popular form of email marketing, the newsletter email links to multiple blog posts, news, and any additional information. Focus on your best pieces of content for these. A roundup email is different than a newsletter because it primarily contains curated content that’s not created by the publisher (aka you). This is usually a massive email that’s meant to teach the reader something. They usually include useful content within the body of the email rather than a title and summary linking to the content on your website. Thank your subscribers for everything and anything. Using “thank you” in your subject line grabs peoples’ attention and makes the recipient feel good. Promotional emails give your readers something to look forward to. Here are nine types to incorporate in your next campaign. Heads up: this may end up in the “Promotions” tab in Gmail. Vero warns to only send these emails to specific lists. After all, “you don’t want to send a discount code to someone who just paid full price yesterday.” Make sure these emails provide real value for the customer. During the holidays, feel free to send a promotional email to people who opted in. Make sure to use said holidays to craft your message, and don’t badger your subscribers with too many of these. When announcing events, you can either incorporate the announcement in another email (like a weekly or monthly newsletter, etc) or use a tailored event announcement email. Make sure you communicate that this event (and announcement) provides value to your readers. Upgrade emails can come in many forms. If you use B2B software at your company, send an analytics report to users and ask them to upgrade for more in-depth metrics. Or offer your readers a premium version of your product or service right off the bat to get them hooked and upgrading faster! “Did you know?” emails are great for surveying you customers about your product. Learn what functionality they still don’t know about and how you can make it more visible. Also use these to onboard users and re-engage inactive users. Yes, click-bait works, but don’t try to oversell it with an exciting subject line and then provide lackluster body content. Make sure to keep your goal in mind (getting people to click links to take them to your site). Invite your readers to something, whether it be as users of a beta product or to a pre-sale, and make them feel special. Segment your lists and then send them to a select group of engaged subscribers. If you’ve done something wrong, apologize for it. Send a personal message apologizing for whatever wrongdoing occurred, and then surprise your readers with a freebie. These emails are necessary to confirm a user’s subscription and therefore must be easy to act on. Be very clear about what you need users to do next. This is a purely transaction email and are, according to Vero, “an important part of the user experience.” Because users need them these emails are almost guaranteed to be opened, so make sure they are on-brand, secure, and timely. Send your customers receipts via email. Not only will they be able to easily access the information, you can also include a call to action in your email to visit your site or check out similar products to what they purchased. Like password reset emails, these emails should be timely and secure. Once you have these down to a science, add value and promote related products or CTAs. You must remind your customers of the value you provide, especially if your product or service renews automatically. These emails exist to move users from their inbox to your website. Get people excited to see what your site has to offer by including other users’ photos, comments, reviews, etc. Make your emails even more useful by allowing users to use your app right inside their inbox. By incorporating functionality into the email itself, your engagement rates will skyrocket. As their name implies, behavioral emails are sent according to a user or subscriber’s particular pattern of behavior or recent actions. The average documented online shopping cart abandonment rate is 68.07 according to the Baymard Institute. Furthermore, Marketing Land reports “more than half of cart retrieval emails are opened, and over a third of cart retrieval emails result in purchases.” So if you’re an Ecommerce site, start taking advantage of these types of emails, maybe even offering $5 or 10% off an order to give your leads a nudge! According to Vero, “only a handful of businesses have mastered the art of turning browsing history into a sales tool.” This email will use similar tactics to the abandoned shopping cart email but are intended for leads a few steps back in the buying funnel. These are the types of emails you send after someone provides their information to download an eBook or tip sheet. This email should not only include the promised asset, but also offer something else (like a link to recommend it to a friend or to sign up for a free trial). It’s important to gather product reviews, as this data is incredibly valuable to both your customers and your business. You can then use these reviews in Notification emails or Abandoned Shopping Cart emails to push customers to purchase. If you’ve gathered some data on your customers and subscribers and know what they like, then it’s time to recommend something to them. These emails are where promotional email marketing really dives into behavioral email marketing. If your product or service requires set up to get users onboard, you might run into some issues. These emails provide guidance to users and let them know how to get their accounts up and running. These emails look like transactional emails but are actually promotional in nature. Although a bit deceptive, they’re more well received than something blatantly promotional. This is another great way to accumulate data. Be conversational and ask specific questions to get the feedback you need. Because consumers trust what other consumers think, it’s important to provide social proof of the product or service you’re offering. A milestone email celebrates just that: a milestone. Whether your user has just generated 10 posts (a la Wordpress) or created 10 designs (a la Canva), this type of email should reward people, reinforce the value you deliver, build on current momentum, and help people get to the next step. Vero calls this type of email “the lowest-hanging fruit of the customer lifecycle.” The retention email targets your inactive users. Prompt these users to come back and check out your product or service again. After all, retention equals revenue. While email marketing may seem like a daunting task at first, if you know the types of emails that should be used and how to use them, you’re well on your way to becoming an email marketing master. Use these 41 emails to guide you on your journey and see which ones work for you and which simply don’t. Every business is different and not all emails are equally as effective in every industry, so start figuring out which ones are a perfect fit for your company and put your new know-how to work!